I believe it was August when Fluidstance first reached out to me about reviewing their product, The Level. Of course, I was amenable and eagerly awaited its arrival. It wasn’t until October that I realized the packaging containing The Level had been stolen off my front step before I ever saw it. I wrote a post about this theft and The Level generally and Fluidstance generously sent me another one! I’ve been using it for the past few months few years. I didn’t want to write a review too quickly as products like this can be so bright and shiny and fascinating when they first come out but as time passes they fall into disuse – just another item to stuff in the closet/garage/ attic. Fluidstance’s The Level (Natural Maple), available for $289. Before I review The Level I need to give you a little bit of context about me. If you already know me, you can skip this section, if you don’t, I think a minute or two of your time will really inform your understanding of my review. I have a number and diversity of ailments oftentimes not seen in someone twice my age. Most of them don’t connect with my review of The Level but a few do. Namely, I have chronic leg pain. These days it is usually low intensity though occasionally it will flare up with a vengeance. Combine this with some knee and lower back pain and I’m a bit of a disaster. Why does this matter? Because my review comes from the place of someone with chronic health issues and will tend to be informed from that perspective. I hope it will be of use to everyone, but I think it will be especially useful to anyone suffering from chronic pain. 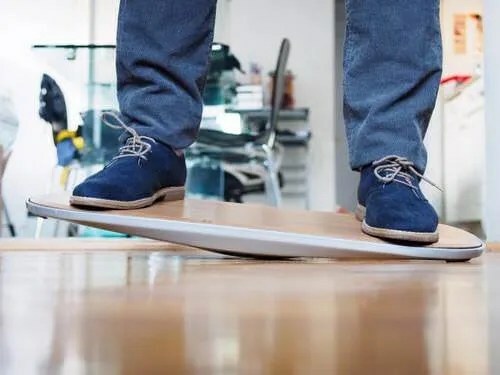 Fluidstance is an Apple-esque company. They don’t make a lot of products but what they do make is top notch in quality and you know this from the moment the box arrives at your door. It is a bit like unpacking an iPhone back in the day before everyone else caught on to how presentation could really affect consumer’s buying decisions. Inside is a nice sack into which one can insert The Level (I suppose to keep it from getting scuffed, wet when raining, etc.). Then there is The Level itself. It is beautiful with a nicely finished bamboo top and a sturdy aluminum base (I know, sturdy is not the first word that comes to mind when someone mentions aluminum, but this is not your soda can’s aluminum!). Fluidstance positions itself as an eco-friendly company, something which is especially popular these days, but they aren’t just saying a popular slogan to gain customers. Check their website and you’ll see that the use of bamboo for the wood was chosen because of it’s abundance and renewable nature. The base is recycled aluminum made in a solar-powered facility. Even the finish was chosen due to its low emissions. I like the company culture this seems to express. Fluidstance’s serious commitment to the environment makes me feel that they are concerned about more than making money (not that there is anything wrong with making money, we all gotta eat, sleep, and play) and makes me optimistic that they will steward well in other areas – e.g., genuinely helpful customer support, pride in the quality of the product, and actually caring for their employees. The Level is a solid product. There is no planned obsolescence built in! Seriously, I believe this product will last years – assuming you don’t light it on fire, allow your dog to repeatedly chew on it, submit it to a world’s strongest man crushing objects competition, etc. You’d think that a product like this, which has a decent amount of weight placed on it day in and day out and which has someone standing on and scuffing around it would begin to deteriorate. Other than a few cosmetic scratches on the bottom of the aluminum base (which is wobbling around while you stand on it and which may have come via other means – e.g., me not being the best at occasionally moving through doorways or hallways without bumping into them) it looks as good as the day I received it (several years ago!). We know its beautiful and responsibly manufactured, but does it work? The short answer is yes, the longer answer is yes, and especially for me (and you?) with chronic pain. I bought a sit/stand desk because in addition to being healthier than sitting and burning more calories I experience significant flare-ups in my chronic pain if I remain in any one position too long. It worked, but not as well as I had hoped. I couldn’t stand for prolonged periods of time without the pain flaring, so I had to spend more time going back and forth between sitting and standing than I wanted to. Then came The Level. I was worried at first it was just a placebo effect, but it has been lasting. I can stand for much more extended periods without causing significant flareups in my legs (primary pain point), knees (secondary), or lower back. These days I’m likely to do 2.5 to 3 hrs. standing before I need a break. Previously there were times where the pain began to flare almost instantaneously and it was certainly significant within 1.5 to 2 hrs. These days I might even go 4 or 6 hours standing at one time. The Level keeps my legs moving a little bit all the time and, if I begin to feel some tension (or for the fun of it), I can increase the amount of movement significantly, all while still working productively. When I first received The Level it didn’t move much and I was surprised. It isn’t meant to be an aerobic experience, but I did expect a bit more movement. Ends up this was entirely my fault. I had one of those rubber mats one stands on to relieve foot/leg/knee pressure incurred standing on a hard floor. I knew The Level wasn’t supposed to be used on smooth floors (too slippery) but I figured that a rubber mat would serve the same purpose on my hard floors as a throw rug/carpet. I was WRONG. Once I started using The Level on carpet I experienced a significant (though not unpleasant) increase in motion. Unless you only want The Level to move only when you move (e.g. it will move when you shift body weight) and not a sort of constant, fluid motion – use carpet! The Level isn’t an inexpensive product. The American-Made Level (Bamboo) I was sent retails for $389. Not the sort of money one drops without consideration (at least, not that I do). There are lower priced models available – The American Made Level (Maple with Walnut Finish) for $339 and the American-Made Level (Natural Maple) for $289, but these are still not your bargain-value prices. More recently they’ve released The Plane Cloud which comes at $189 but even this isn’t a spur of the moment purchase. Why would I buy this product? Is it because it is new and cool looking or because I’d actually use it? How much of my life is spent at a desk? Lifehacker once recommended spending your money where your time is spent – and I think this is spectacular advice. Most of us spend a lot of time at our desk most days! Could this help with any ongoing health issues I have? Would this help me significantly increase the amount of time I spend standing rather than sitting? What About Inexpensive Competitor Products? What is the difference in price between The Level and the competitive product I’m looking at? What is the quality of the two products? Am I getting more product quality for the extra price of The Level? What is the reputation of the company? Do they care about their customers? Do they care about this product? Will they be around next year? Personally, I’m a fan of the middle-of-the-road approach. I don’t need luxury, but I also know that buying cheap oftentimes means buying multiple over time. I’d rather spend a bit more upfront to get a quality product that is going to last than one that will soon need replacement or repairs. For me, time is my most valuable asset, not money. If the competitive product will last five years but need to be repaired twice and this takes me 1 hour each time to call the manufacturer, secure an RMA, go to the post office, etc. – how much is that time worth? This is not necessarily what you are paid, but what you believe inherently is the value of your time. Is your time worth $10, $30, $50, $100, $250, an hour? Factor in the time you are likely to spend maintaining the lower quality product. Is the price once you include your time still lower for the competitive product? If not, you know what to do! I’m still using the Fluidstance most days, sometimes for the entire day, sometimes swapping back and forth between sitting and standing every few hours and I still love it. The only change I’d love to see at some point is an (optional) increased angle to require more effort balancing and increase movement overall. Using it for a few years I’ve mastered my balance at the current Level angle but would love to up the ante a bit to keep my body moving/working throughout the day. I can’t speak for everyone, but for me, The Level is a worthwhile investment. Yes, it makes me cringe a bit to think of buying something so simple for so much but if I divide the cost by the number of days I’ll use it this year it becomes much more reasonable. How many days do we work in a year? Lets say 240. Now we are talking about paying $1.20 per working day for this convenience if we purchase the lower end Level. If we purchase the highest? $1.62/day. Pretty reasonable for a product that will probably last years. The Level does what it promises – helps one maintain motion even while standing at a desk and thus relieving pressure on the body. For me, personally, I see reduced pain in my legs, knees, and back from using The Level. What do you think? I’m eager to hear from everyone but would be especially interested to hear from anyone else who is using The Level and has chronic health issues and whether it helps with these. Am I unique in experiencing some relief?